I’ve always had a serious appreciation for cereal. As a kid, I loved it so much I wouldn’t even put milk in it – I never understood why one would one do such a thing as to dampen that satisfying crunch. Like most kids, I went through stages of favorite boxes. The childhood staple was hands down Frosted Flakes. Then Oh’s – do you remember those? In my more mature high school years I gorged on Raisin Bran Crunch and Honey Bunches of Oats. And in college I rediscovered the greatness of Cinnamon Toast Crunch. Mmmmm. Up until I went gluten and dairy free I still had my cereal just about every morning for breakfast. 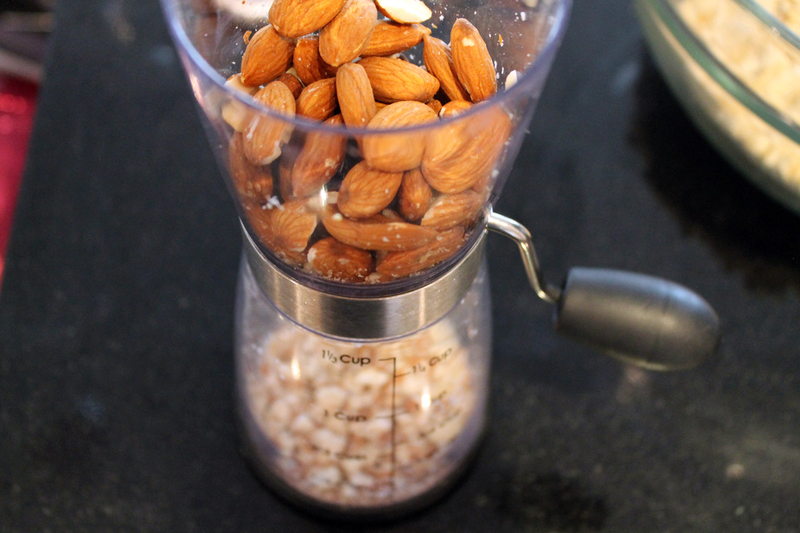 It’s easy, filling, and goes perfectly with a cup of coffee and/or orange juice. The problem is most out there are loaded with sugar and empty calories that set you up for a spike in blood sugar and energy followed by a just as rapid decline later in the morning. We feel it as adults. So just imagine what that kind of roller coaster does to kids who eat these sugar-laden flakes before heading out the door to sit in a classroom. Um, can you say disaster? When shopping for a cereal, like all boxed foods, check the labels. Read the ingredient lists closely. A lot of popular cereals list sugar (or high fructose corn syrup) as the second or third ingredient. Ingredients are listed in quantity so that means there’s more sugar in it than just about anything else. If there’s any sugar at all in your cereal of choice, it should be way, way, down on the list. Like, last. What you want to see is “whole-grain” and it should be pretty high up there. 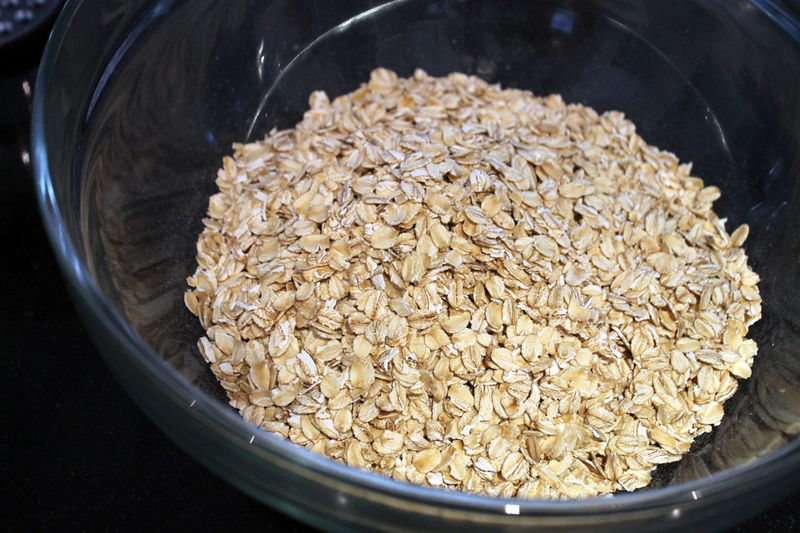 The more whole-grains, the more satisfying and filling you’ll find a cereal to be. Whole-grain means the fiber is intact, which happens to the most nutritious part of a whole grain – and it helps to regulate the breakdown and absorption of the starch into your blood stream. That means no more highs and lows and a more sustainable energy to last you through the morning. As I mentioned, I ate cereal almost daily for breakfast up until going gluten-free. My favorite cereals were some of the harder food items for me to part with. I know there are gluten-free cereals out there, and I’m sure some are quite good, but, oh, those labels. Instead I opted for rice cakes and peanut butter, smoothies, and fruit and nuts in the morning. Until one day I just couldn’t take it anymore. I craved that crunch. So I went to the blogs and sure enough Sarah B. didn’t disappoint. 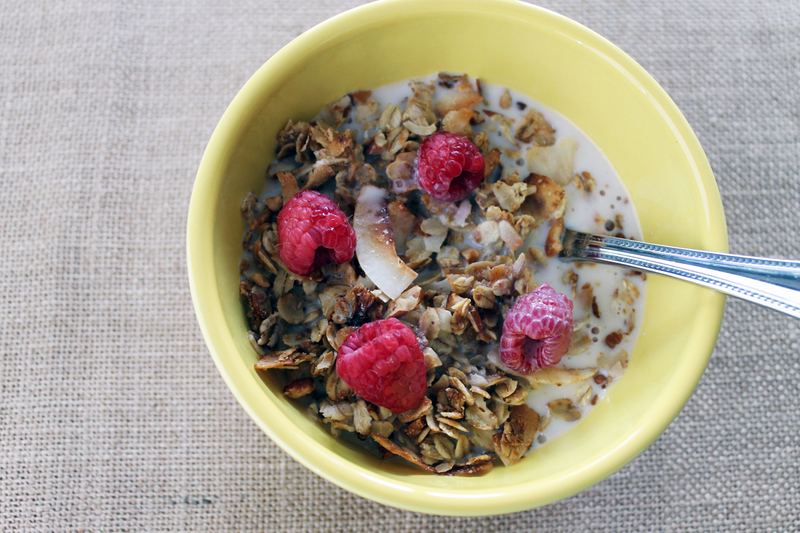 I found her Simple Gourmet Granola and I’ve been keeping my pantry stocked with the stuff ever since. I remember making the cereal that same morning, popping it in the oven, and feeling frustrated that I had to wait for it bake rather than pouring it from a box. Is this what my life has come to? I have to make everything?! Ugh. When it was finally ready and I snuck a few flakes to taste, I remember that crunch… I thought, “THANK YOU GOD!” grateful to be reunited with an old go-to. I have the same reaction whenever I discover or make anything gluten/dairy-free that I thought I might never enjoy again. And you know what? Often the new version is even better than the old. Or maybe it just tastes that way when you appreciate it that much more. *If gluten-free, make sure to purchase certified gluten-free oats. Preheat oven to 350 and grease a large baking sheet with coconut oil. Heat a small sauce pan over medium-low heat. Add coconut oil and honey to the pan to melt. Stir the two together to combine. 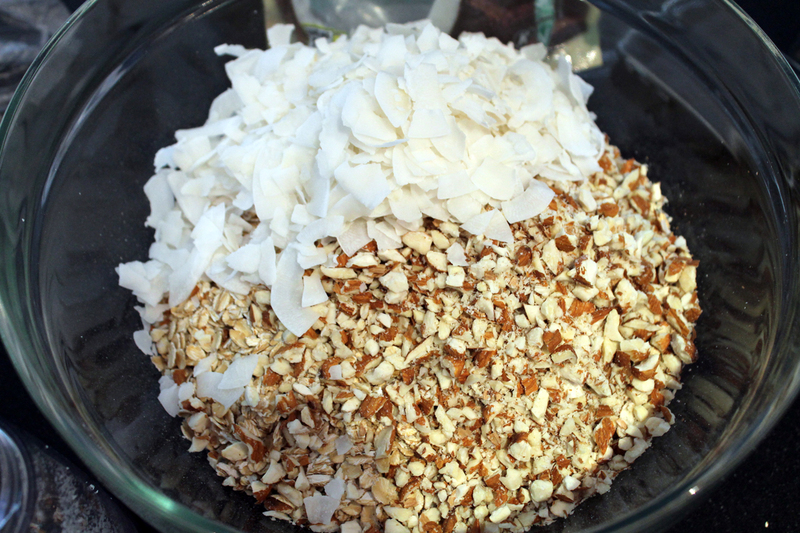 In a large mixing bowl, add oats, almonds, coconut flakes and salt. Stir to combine. 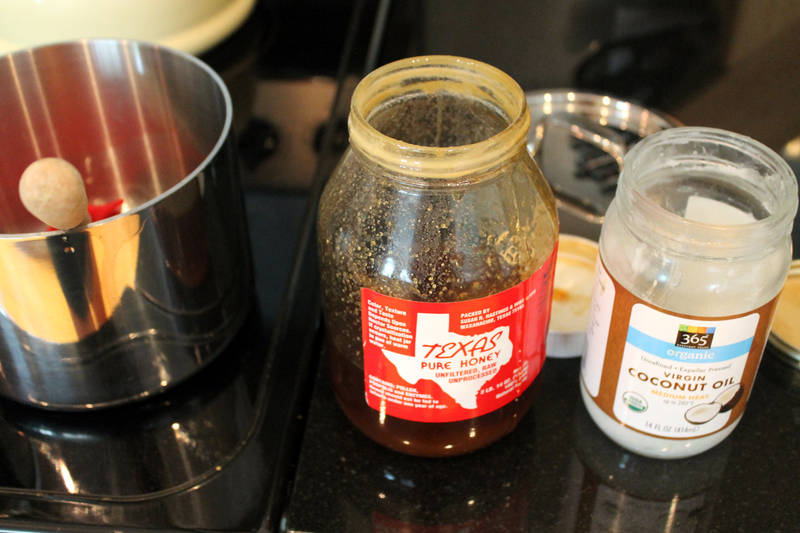 Slowly pour coconut oil-honey mixture over the cereal. You want to cover as much of the cereal as possible so drizzle over the surface to cover, then stir to mix evenly. 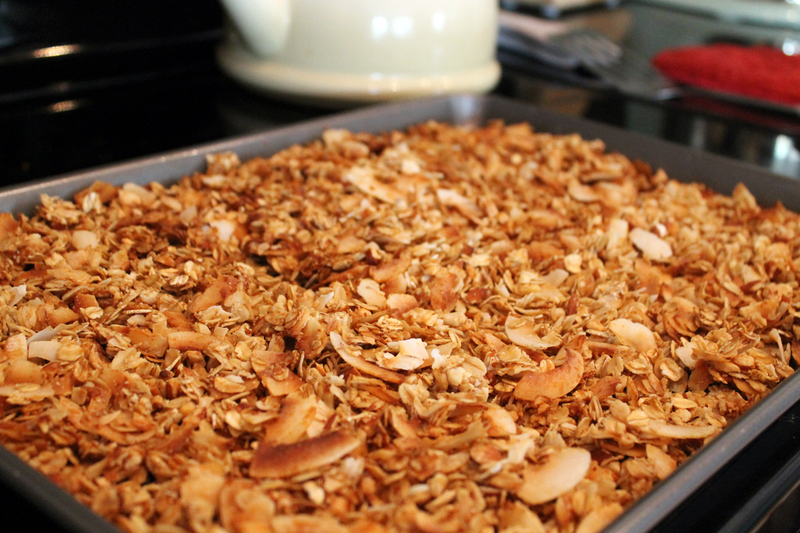 Pour cereal mix onto baking sheet and spread evenly across sheet.